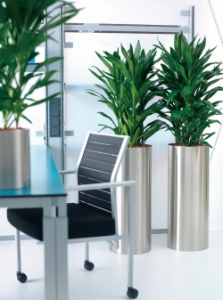 Turn an underused or dull space into an attractive and distinctive area by adding potted plants. Decorating with plants is easy because plants are versatile. You can use plants to create a certain ambiance, to showcase favorite plants, or to introduce specific colors into your space. Building on our expertise with Fort Worth landscaping, Blooms Landcare can help you achieve a natural and memorable setting indoors with our Pots Alive program. In particular, winter months are a good time to add bold color combinations or to bring fresh scents from your favorite garden flowers indoors. Decorative pots give you the perfect opportunity to brighten your home or office without making a long-term commitment to redecorating. You can use containers to add many colors or choose one color and repeat it with many containers. Bright colors will liven up a space, but neutrals will help to evoke a more relaxed setting. We have all the colors, shapes, and styles you could ever imagine. Even with commercial landscaping, it’s a good idea to establish your own identity. You can choose to create a formal look by using plants that have a symmetrical structure in containers with a tailored appearance. Depending on the overall décor of your business, you may prefer to mix styles for a more eclectic look. When you combine your favorite plants with our pots, you create a display that is all your own. Plants in containers give your space height and depth. You can emphasize a room or entryway with high ceilings by using tall plants in tall containers. Wide containers with a combination of plants that sprawl over the sides and rise up in the center will help ground a large empty section of a room. Let us help you choose plants and decorative pots to define your space in the way that suits you best. Contact or Call Blooms Landcare today at (817) 688-5352 and ask about our Pots Alive program.